You look great. OMG, your skin looks so good. Did you have some kind of procedure? Tell me, what did you do? I have heard this at least 10 times this week. I had what is known as a DF Facial at Primary Aesthetic in Bedford, New York. From the minute I walked through the door I am put at ease and at the same time eager to see the results. I knew that I was in for a treat. From the receptionist, to the facialist and of course consulting with Elena Ginsberg. Elena Ginsberg FNP, MSN, BSN founder of Primary Aesthetic Skin Care is a Certified Nurse Practitioner based in Bedford, NY. with over 18 years experience in medical aesthetics and cosmetic procedures. Elena Ginsberg is an expert an injectables. She is one of the few practitioners devoting her entire practice to the field of aesthetics. I completely trust her. She has a trained aesthetic eye plus she continuously advances herself with post-master courses in medical aesthetics. After years of training and working closely with the leading plastic surgeons and injectors in Europe and in the USA, she now provides training to a new generation of Aesthetic doctors and nurses. All of these have been an important part of her work …. not so with other practices offering cosmetic injectables. Primary Aesthetic has been my secret weapon of late. They have all the latest equipment when it comes to anti-aging. The DF facial was extraordinary. It is recognized as one of the most advanced approaches to treating the unwanted signs of aging. It helps high levels of vitamins A,C and E and growth factors to penetrate the skin and help diminish appearance of fine lines, lose skin, pigmentation, sun damage and scarring.The Ionzyme DF machine is the most effective machine in the world today for enhancing penetration of active ingredients into the skin. It lightens and brightens your skin by infusing vitamin C directly into your face. The Environ DF Facial uses a plain, featureless white mask to rejuvenate the skin. It is terrifying looking, really.Stacy Geisinger on Vimeo. The Environ lonzyme® DF Machine is a truly impressive facial tool that delivers outstanding results! The DF Machine is designed to be used during a facial treatment to intensify the effectiveness of the Environ® products. It offers a combination of pulsed iontophoresis and low frequency sonophoresis to give you long-lasting results not offered by any other facial machine! 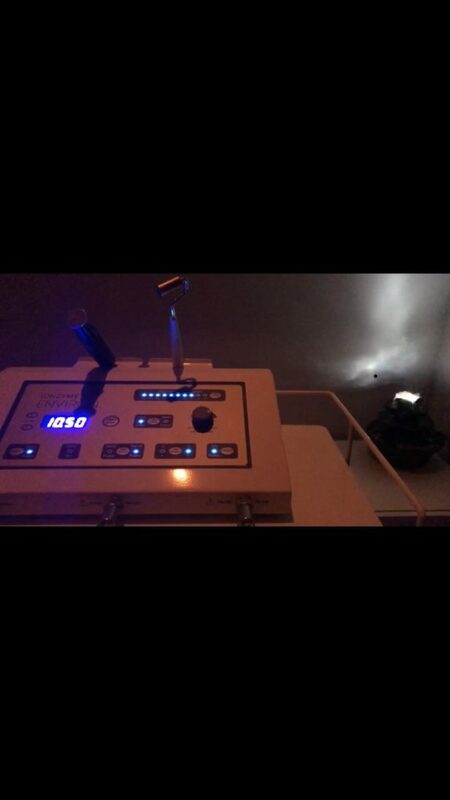 The DF Machine can help combat dry skin, large pores, fine lines, acne scars, and so much more. The electro-sonic powers of the DF Facial helps the active ingredients soak in through that barrier whilst nourishing your skin. The Environ Professional range is chockful of essential nutrients and vitamins for the skin to boost back up the levels of goodness that can be lost through lifestyle – for example, you can lose vitamin A through sun exposure. The semi-electrocution (not really) of the DF Facial gets these ingredients deep into the skin so that they can act at their top effectiveness on a molecular level, increasing the rate of cell renewal and boosting natural elastin and collagen production. The DF Facial works magic on scars, marks, pigmentation, ageing skin and even conditions like eczema. The use of The DF Machine is critical for reaching the deeper layers of skin,and helps break through the skin’s natural waterproof barrier, therefore allowing the product to penetrate deeper, creating even greater results! This treatment is designed to stimulate the thickening of the skin cells and improve the production of skin elasticity and collagen. This entry was posted in Beauty, Westchester. Bookmark the permalink.